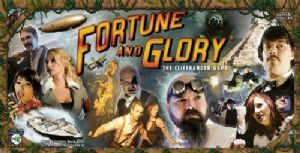 Fortune and Glory is a unique game play experience. It was created by the same team that brought you Last Night on Earth, A Touch of Evil, Invasion from Outer Space, andConquest of Planet Earth, so it will certainly feel like a Flying Frog game. It shares some ideas with other Flying Frog games, like skill tests similar to A Touch of Evil, but the mechanics are unique to Fortune and Glory. Like many of our previous games, there are multiple ways to play. Fortune and Glory features four game types -Competitive, Cooperative, Team Game, and Solo play. This is also our biggest game yet - twice the size of our previous games! The game has actually been around for years and it is one of our favorites. It is a mammoth adventure game that spans the globe. It means a lot to us and we didn't want to do it half-way. We wanted the giant game board, full card decks for Enemies, Nazis, Gear, Allies, Locations, etc, and really cool minis for everything! NB Due to the size of the box this game will be sent by courier!